As advertising by state parties and outside groups ramps up, so do complaints about untruthful or misleading attacks and claims. AUGUSTA — The leaves may still be changing outside, but it’s officially political mud season in Maine. The negative political advertising wars are fully underway, with both parties as well as outside groups targeting the other side’s candidates and then accusing the opposition of misleading or flat-out dishonest statements. In a new ad in the tight, four-person race for governor, the Republican Party is hitting Democratic nominee Janet Mills for “double dipping” by collecting both a paycheck as attorney general and a modest pension for her dozen-plus years as a district attorney. Democratic leaders in the Maine Senate, meanwhile, are accusing their Republican counterparts of outright lies or fabrications in mailings sent to voters in several closely fought districts. “There’s a big difference between partisan rancor and outright lies,” said Sen. Troy Jackson, D-Allagash, the leader of the Senate’s minority caucus. Outside groups and parties have already spent or committed nearly $7 million to the governor’s race, not including the millions spent by the four candidates themselves. Millions more will be spent on legislative races in an election that will decide which party – or parties – will control the House and Senate when the next governor takes office in January. And as ads and mailers accumulate, so do the allegations from both sides that those messages are replete with lies, distortions and inaccuracies. 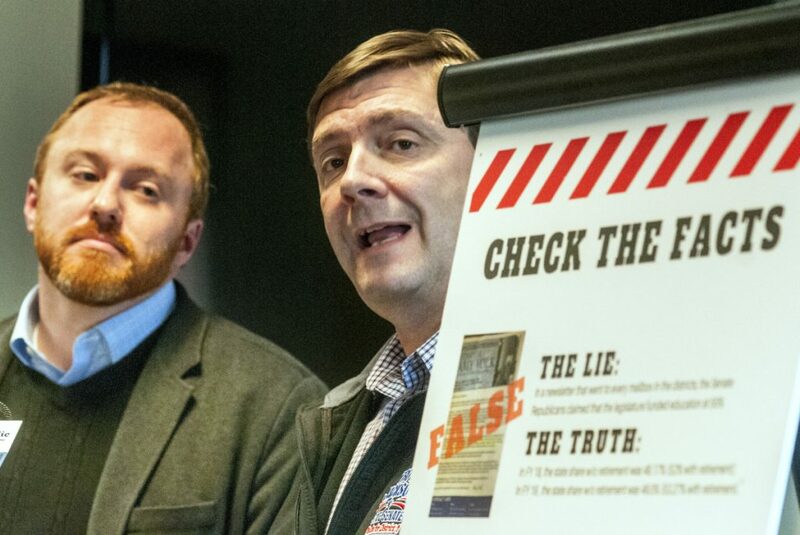 On Thursday, Jackson and Assistant Senate Majority Leader Nate Libby, D-Lewiston, held a news conference to blast political action committees formed or headed by opposition Republicans. A sign from the Augusta news conference held by Democratic state Sens. 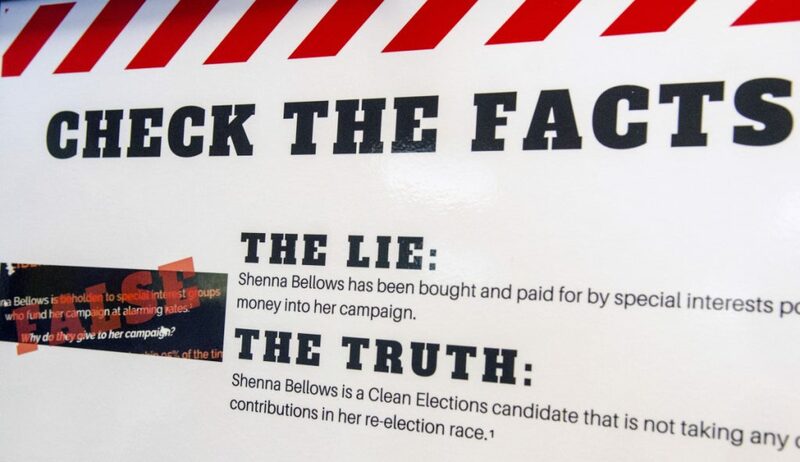 Nate Libby and Troy Jackson seeks to rebut a claim that Sen. Shenna Bellows, D-Manchester, has been “bought and paid for by special interests,” by noting she is a Clean Elections candidate not taking contributions in her race. One of the complaints from Jackson and Libby was that the Republicans had circulated a mailer claiming that their Senate District 14 candidate, Matthew Stone, who is challenging state Sen. Shenna Bellows, D-Manchester, was born and raised in the district. In fact, Stone was born in Brunswick and grew up in Litchfield, which is now in neighboring Senate District 22. Jackson and Libby also pointed to fliers that imply a Democratic candidate voted against tax cuts when, in fact, the candidate has never served in the Legislature. They also said Republican fliers inaccurately claimed a candidate was endorsed by the Sportsman’s Alliance of Maine when, in reality, the organization did not endorse anyone in the race. “What we have here is blatant inarguable lies,” Jackson said. He called on outgoing Maine Senate President Michael Thibodeau, R-Winterport, to stand by a speech he made in the waning hours of the last legislative session about honesty. Thibodeau is the principal officer of the Maine Senate Republican Majority PAC that has spent nearly $130,000 this year. So far, the Maine Republican Party Committee has spent close to $1 million this cycle, while the Maine Democratic State Committee has spent about $1.8 million. 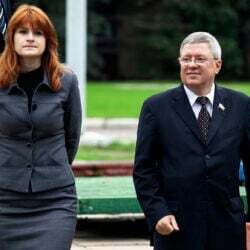 Jackson also is the principal officer for the Senate Democratic Campaign Committee, which has given about $625,000 to the state party committee in 2018. “Democrats have been attacking and misleading voters for months, but now try to trick the press into blowing this out of proportion,” Savage said. Much of the negative advertising in the governor’s race so far has been aired by outside groups or the state’s Democratic or Republican parties, typically with financial backing from the Democratic Governors Association or the Republican Governors Association. The four candidates – Mills, Republican Shawn Moody, and independents Terry Hayes and Alan Caron – have maintained a largely positive and civil tone with each other in public. In the latest ad salvo by outside groups, the Maine Republican Party is criticizing Mills for collecting both a paycheck as attorney general and a pension for her four terms as district attorney in western Maine. “Double dipping,” as critics like to call it, is both legal and relatively commonplace among public employees in Maine, especially in school systems. Republican Gov. Paul LePage has repeatedly raised the “double dipper” issue in his attacks on what he sees as bloated administrative ranks in public schools. In 2017, nearly 2,500 individuals working for the state, municipalities or public school systems received both a taxpayer-supported salary and pension payments, according to data from the Maine Public Employees Retirement System. The average pension payout for such employees – the vast majority of whom are school district administrators or teachers – was $30,332 last year. Mills earned $119,658 as attorney general but also collected $12,403 in pension from her years as the district attorney for Androscoggin, Franklin and Oxford counties. That placed Mills in the bottom 15 percent of all so-called “double dippers” in Maine that year, according to the Maine PERS pension data. When Republicans took control of the Legislature in 2010 and elected a new attorney general, Mills began taking her pension afterward so she could continue receiving health insurance through the state retirement system. When she was re-elected attorney general in 2013, she was advised to continue withdrawing pension benefits to keep her health care coverage. The state no longer contributes to her pension fund because she is receiving payments. Moody, meanwhile, has been the target for weeks of negative ads that his campaign has assailed as false or misleading. The highest-profile ad, which aired for several weeks in Maine, focuses on funding for public schools and shows a video clip of Moody saying that schools are “overfunded.” The group behind the ad, a political action committee known as A Better Maine, received much of its funding from the Democratic Governors Association. Since the ad surfaced, Moody and his campaign have clarified that the candidate believes school districts are top-heavy with administrators and that more money needs to flow to classrooms. The Maine Conservation Voters Action Fund, meanwhile, announced a $500,000 advertising and direct mail campaign targeting Moody for his stance on climate change. While Moody agrees that the climate is changing, he has in the past questioned whether humans are the primary driver of those changes.